Can You Guess What’s In This Image? Our universe is filled with a number of fantastic objects. From the dark trenches at the ocean floor to the white clouds that drift across the skies, from the enormous elephants that roam throughout sub-Saharan Africa to the tiny tardigrade that can survive in the vacuum of space, from icy Pluto to supermassive Large Quasar Groups…our universe is a place of astounding diversity. As a result, it’s not too surprising that many things are unfamiliar to us, especially at close range. So what about the image above? It looks a little like the Eye of Sauron, or maybe an abstract sunflower, but of course, it is neither of those things. Take a moment to make a guess, then click to learn the secrets behind this image. This dark little circle is actually an image of the Sun. Don’t recognize it? That’s probably because, specifically, it is a photograph of a sunspot. It was captured by the New Jersey Institute of Technology’s Solar Telescope in August of 2010. According to astronomers, at the time of it’s release, the image was the most detailed picture of its kind to be taken in visible light. The telescope, a part of Big Bear Solar Observatory, uses what is known as a “deformable mirror,” part of an adaptive optics system, in order to compensate for atmospheric distortions and produce ground-based images that have roughly the same clarity as images that are taken from orbiting observatories. 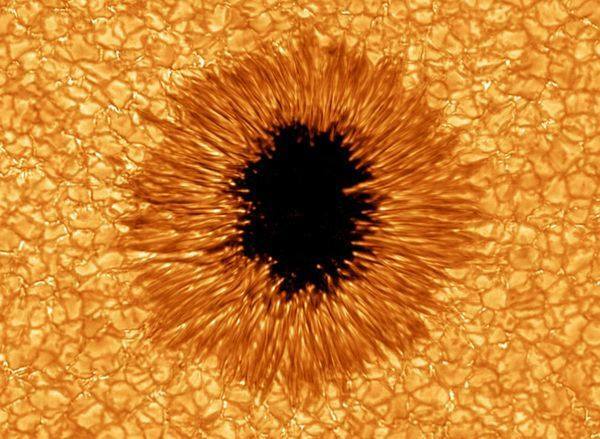 In essence, sunspots are regions on the surface of the Sun (the Sun’s surface is also known as the “photosphere”) that are temporarily cool and dark compared to surrounding regions. But of course, “cool” is an entirely relative term.The average surface temperature of the Sun is generally around 6,000° Celsius (10,800° Fahrenheit) and sunspots are about 1,500° Celsius (2,700° Fahrenheit) cooler than the area surrounding them. That mean that the areas are still upwards of 4,500°C, which is amazingly hot. What’s more, these regions can extend more than 80,000 km (49,800 miles). Sunspots are formed by the turbulent magnetic fields that inhabit the Sun. In these areas, the magnetic field strength is thousands of times stronger than the Earth’s own magnetic field. These dark splotches on the solar surface often appear in pairs that are aligned in an east-west direction. One set will have a positive (north) magnetic field while the other set will have a negative (south) magnetic field.